Hmm. What indeed is Will doing to Bea Dot’s skirt. For that matter, who’s Will and who’s Bea Dot? That, my dears is a random teaser from Nancy Brandon’s Dunaway’s Crossing. It’s 1918 when newlywed Bea Dot Ferguson leaves her posh Savannah lifestyle to visit her cousin in rural Pineview, Georgia. Her purpose: to escape an abusive husband, who knows her shameful secret. Immediately, she learns she’s traded one perilous situation for another, for Pineview has been infected with deadly Spanish influenza. With the help of Great War veteran Will Dunaway, Bea Dot finds herself fighting for survival, not only against her husband’s brutality, but also against the deadliest virus the world has ever known. So Dunaway’s Crossing is the kind of fluffy Southern historical fiction that I like to read from time to time — think Ann Rivers Siddons or something of the like. The post-WWI setting is one that’s pretty rare in historical fiction, so I found that interesting, along with the setting. If historical “women’s fiction” as it’s called it your thing, check Dunaway’s Crossing out. I just discovered when I linked to it that it’s only .99 at Amazon right now. So buy it, even! Teaser Tuesdays is a weekly bookish meme, hosted by MizB of Should Be Reading. Anyone can play along! Just open your current read to a random page and share a few sentences. Be careful not to include spoilers! Now you know why I carefully archive all the little religious tracts I find. 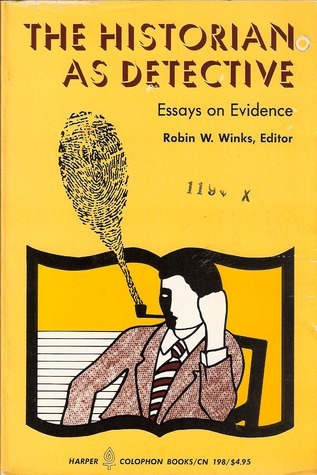 That’s a tiny dose of one of my favorite books of all time, The Historian As Detective — Essays on Evidence, edited by one Robin Winks. Essays by noted historians of the past and present, on the problems of investigation, offer a series of intriguing case studies in the relationship between historical research and detective fiction. Yes, and no. The problems of investigation are indeed covered, as are intriguing case studies, but the detective fiction link is murky. What Winks does is illuminate the sometimes-shadowy way the history we’re given is constructed, how historians, much like detectives, sift through mountains of evidence — complete with red herrings, unreliable witnesses, liars and blackguards, just like in a police procedural — to arrive at an acceptable narrative that explains the past. If it sounds dry and dusty, it’s not, although any copy of The Historian As Detective that you purchase is likely to be. The book has been out of print for decades, despite the fact that Winks, an historian himself (naturally), is a prolific author. It’s a book that’s ripe for rediscovery. I’ll readily admit that I did not expect to enjoy The Historian As Detective half as much as I did, but I found that I could not put it down. From essays about the Kennedy assassination to the problem of forged documents, it’s a fascinating read, and worth looking up. Ouch. That’s Chris Ott discussing a shelved record by my belovedELO (Electric Light Orchestra, for you knaves). The passage is from his book Shallow Rewards: Commentaries on Pop 2005-2012. Curious? A compilation of the author’s views on pop music memorabilia and music culture in the digital age. That was deep, wasn’t it? And that’s exactly what the book is. I don’t know why I bought it. After all, Ott has the gall to emasculate and castigate MY BELOVED ELO. But I actually liked it. That, babies, is a little bite of Through a Glass Darkly by Karleen Koen. Don’t you want to know more? Karleen Koen’s sweeping saga contains unforgettable characters consumed with passion: the extraordinarily beautiful fifteen-year-old noblewoman, Barbara Alderley; the man she adores, the wickedly handsome Roger MontGeoffry; her grandmother, the duchess, who rules the family with cunning and wit; and her mother, the ineffably cruel, self-centered and licentious Diana. Like no other work, Through a Glass Darkly is infused with intrigue, sweetened by romance and awash in the black ink of betrayal.